CAMERAS are strewn around our environment, catching glimpses of our faces everywhere we go, yet even the best facial recognition technology still has a hard time picking us out of the crowd. So the US government’s Intelligence Advanced Research Projects Activity (IARPA) has called for a new approach. The agency announced a contest on 8 November, challenging teams of the country’s top researchers to revolutionise how machines recognise people. Those entering the competition already know that conventional facial recognition won’t cut it. Robots will be patrolling cities by 2040 according to Professor Noel Sharkey, who predicts their tasks will include asking for ID, tasering and arresting suspects as well as crowd control. In an article entitled 2084: Big robot is watching you, Sharkey, a robotics professor at the University of Sheffield, forecasts a world in which the jobs of surveillance, security and law enforcement have largely been handed over to artificial intelligence. As more and more information is released via National Security Administration whistleblower Edward Snowden, many Americans drifting through each day blissfully unaware of what country they really live in have had the curtain pulled back just enough to be fed their first spoonful of reality…it’s a bitter taste. The clip below is of a public service message warning the public on the growing use of technology and surveillance by government and corporations (though who can really tell the difference these days) to control our lives. Sure, you say. We know all about that. Snowden has conclusively shown us with leaked documentation what our government is doing to us. Ah. But the film was not made last week or even last decade; it was filmed in 1974. The U.S. government can track where you are, who you’re with, what you look like, and where you’ll likely be next thanks to a tool created by defense contractor Raytheon. ABOUT 15,000 people have had images of their faces captured on an Australian Federal Police database in its first year of operation, igniting fears that the rise of facial recognition systems will lead to CCTV cameras being installed on every street corner. The database includes pictures of alleged criminals who may not know their images are on file. The AFP say facial recognition may eventually be considered as credible as fingerprints, but images on their database are not being shared with state police forces. Sharing images on a national database could be possible by 2015. The president of Australian Councils for Civil Liberties, Terry O’Gorman, said it was troubling that technologies such as facial and number plate recognition had become so widespread and there appeared to be no independent monitoring of the impacts on privacy. The justification for widespread CCTV has also been questioned, with a report by police in London, the most spied-upon city in the world, showing that only one crime was solved per 1000 cameras. Disney wants to show you a whole new world, but not everyone is feeling the love. On Monday, the Walt Disney Company (NYSE:DIS) announced an ambitious plan to transform the visitor experience at its Disney World Resort near Orlando, Fla. 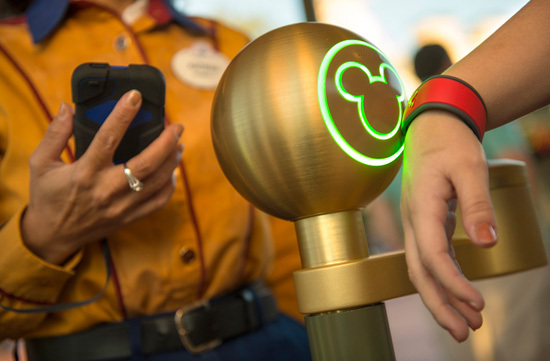 The MyMagic+ program, which will roll out this spring, combines an interactive website and mobile app with an all-purpose electronic bracelet that acts as a guest’s room key, theme-park ticket and payment account all rolled into one. The bracelets, dubbed MagicBands, will also track which rides visitors use, which characters they interact with, where they go and what they buy within the park. The bracelets monitor behavior with radio-frequency identification technology, or RFID, a wireless tracking system that transfers data from tiny tags attached to objects. RFID has long been used to track product inventory in various industries, but it has become increasingly invasive over the last decade, with tags being implanted in I.D. badges, transit cards and even passports.